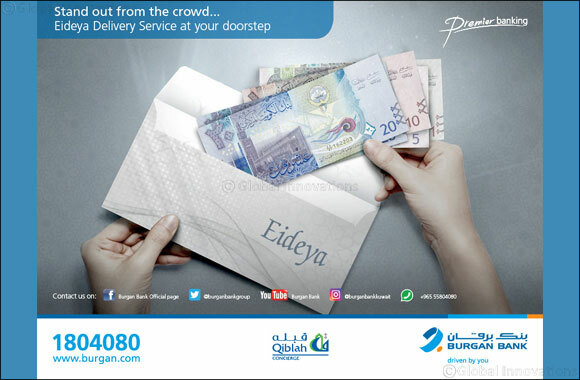 Kuwait, 4 August 2018: Burgan Bank announced today the free Eideya Delivery service to Premier Banking Customers in collaboration with “Qiblah” company for concierge services. This service enables Premier Banking customers to receive new bank notes before the Eid holidays at their offices or homes, avoiding the hassle of waiting in the branches at that time of the year. To request this service, Premier customers can simply contact Qiblah concierge services starting 9 am until 6 pm, by calling 22317755 or emailing Burganpremier@qiblah.com.kw to request the amount of Eid money required and state their address in order for the concierge messenger to deliver it accordingly noting that this service is available from 5th till 15th of August 2018 (Except Friday). It is worth mentioning that the Eideya delivery service comes as part of the bank’s wide range of valuable privileges and benefits that is especially designated for its Premier customers. Additionally, the bank’s collaboration with “Qiblah” for concierge services stems from its commitment of supporting its customers’ everyday requirements with unmatched personalized experience. Burgan Bank’s premier customers can avail instant concierge services from a selected list of more than 20 services such as travel bookings, airport transfers, visa assistance, party planning, valet parkers and others.